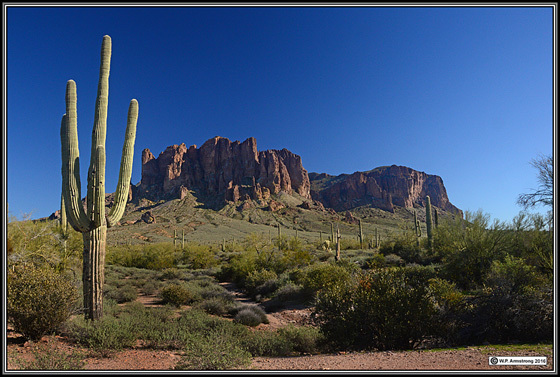 A note to viewers of this page: The primary objective of this road trip was to photograph interesting ants and beautiful scenary in this lovely part of Arizona. 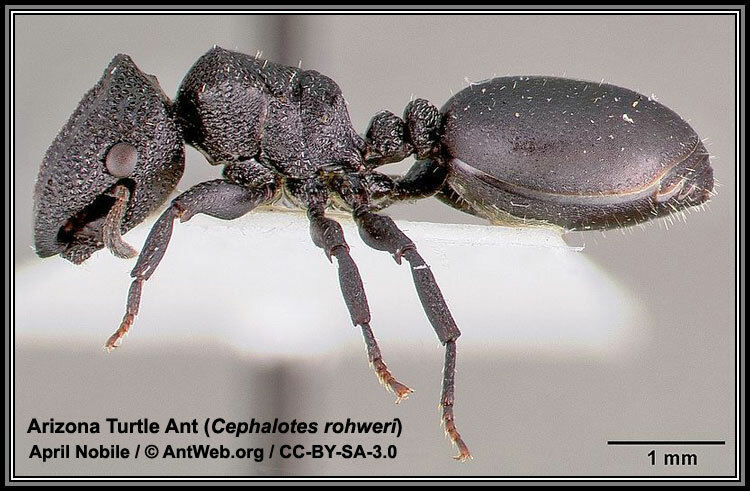 I especially wanted to photograph the bizarre Arizona turtle ant (Cephalotes rohweri). The plate-like heads of soldiers have evolved into perfect circular doors to block the nest entrance! These ants nest in cavities in the stems of palo verde trees (Cercidium microphyllum = Parkinsonia microphylla) made by beetles. Unfortunately, I did not find this remarkable ant. Possibly I was too early in the year. 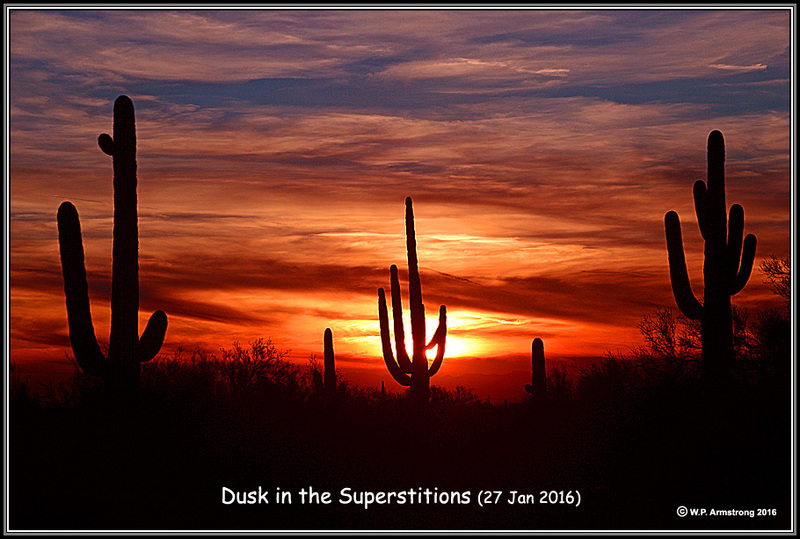 A better time would have been in April or May when the palo verde are in bloom. If indeed these ants feed on pollen, then searching for them when their host tree is in bloom seems like the best time. In the meantime, I must refer to the excellent image by April Nobile on AntWeb.org. Alex Wild also has some marvelous images of this unusual ant on his website. Although I did not find the turtle ant on this road trip, I did make another interesting ant discovery in the Superstitions. I found a minute army ant of the genus Neivamyrmex under a rock. Based on its minute size and several other distinguishing characteristics, I think it may be the seldom observed species N. nyensis. According to Neivamyrmex authority Gordon Snelling (Personal Communication, 26 Jan. 2017), it is N. leonardi! 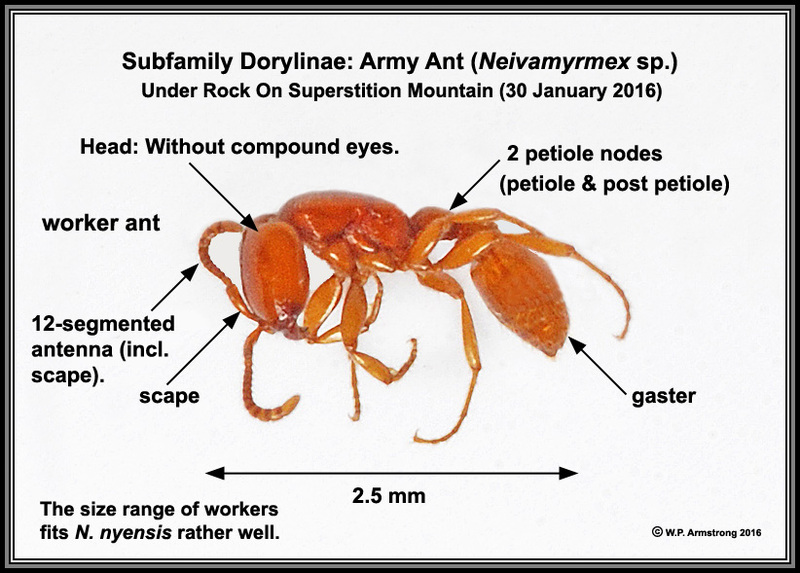 A nearby rock had an equally small species of Forelius, but army ants are easy to distinguish because they do not have eyes. Since they are blind, they must trail closely behind each other, like following the car in front of you in dense Fresno ground fog. Army ant worker (Neivamyrmex) from under a rock on Superstition Mountain. Based on the description and key to Neivamyrmex in Antwiki.org (and small size), it appears to be N. nyensis, a seldom observed species. According to Neivamyrmex authority Gordon Snelling (Personal Communication, 26 Jan. 2017), it is N. leonardi!